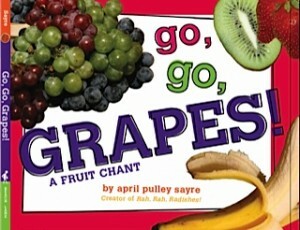 Go, Go, Grapes: a Fruit Chant, my new book, was released by Beach Lane Books, a division of Simon & Schuster today. Please join me in eating some fruit to salute designer Lauren Rille for her joyful design of this new book! It is available on paper and also in a digital form.